I think most of us can probably be found guilty of partaking of at least one of these comforting treats. Unfortunately, the energy provided by fast and processed foods and drinks are fleeting, leaving behind a few extra pounds and an irritable disposition. Don’t fret! There is a healthy answer to your search for lasting fall energy. 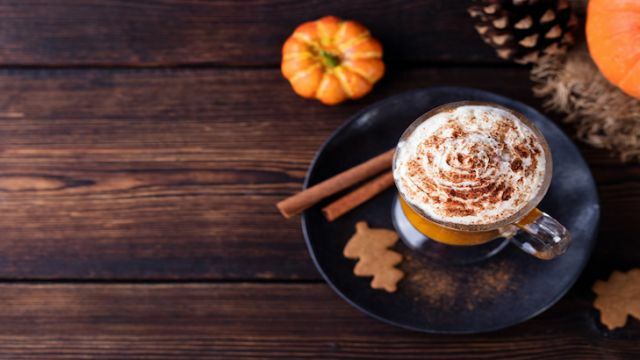 Here are five of my favorite autumn elixirs that boost energy, increase alertness and give us vital nutrients that the body can use resourcefully. Not to mention the fact that they are just plain yummy, yummy, yummy. Ginger is a well known and globally used medicinal herb that is teaming with health-promoting properties. Ginger combats fatigue by boosting circulation and improving blood sugar levels. Ginger also assists the immune system which is especially important during cold and flu season. Add the ginger, star anise and cardamon to 4 cups of boiling water. Add in cloves and simmer for 5 more minutes. Reduce the heat and add in lemon juice. Stir in the honey, filter, and enjoy! This drink blows any special coffee shop drink out of the water with its delectable taste and healthy ingredients. Pumpkin is amazing when you hit that afternoon slump, and your mind starts to wander. It can boost your mood and give you just what you need to make it through the day. Organic coffee is in a class all by itself for energy boosting properties. Caffeine blocks the effects that the neurotransmitter adenosine has on the brain. By doing so, the caffeine increases brain activity and the release of neurotransmitters such as dopamine and norepinephrine. Controlled trials have examined the effects that caffeine has on the brain and have found that it improves mood, reaction time, memory and overall cognitive function. Add the milk and the pumpkin to a small pot and warm over medium heat. Whisk constantly until you bring mixture to a simmer. Add stevia, cinnamon, nutmeg, and ginger. Whisk until mixture is frothy. Add coffee to a mug and pour pumpkin mixture on top. There is nothing that ushers in the winter season better than a cup of smooth hot chocolate. Unfortunately, many commercial powders and mixes contain processed ingredients that rob energy from the body. Cocoa, without added ingredients, has many reported health benefits including mood improvement, immunity boost, and increased brain health. Coconut oil is a healthy saturated fat that has been shown to improve energy levels, regulate metabolism and enhance cognitive performance. More than 2000 studies have been done on this tropical treasure and all that it offers for great health. Top with heavy whipping cream and cinnamon. So, the next time you reach for an unhealthy snack to boost your energy, try one of these soothing and delicious drinks instead. You will have a notable increase in energy and feel better all the way around! Hey Buddy!, I found this information for you: "3 Warming Autumn Elixirs That Taste Great and Boost Energy". Here is the website link: https://www.thealternativedaily.com/warming-autumn-elixirs-boost-energy/. Thank you.